.I did feel that the SCS4's treble was slightly shelved down, which resulted in a little less harmonic information and a little less air around instruments than I am accustomed to hearing." Features "Designed for duties both in music and home-theater systems -- in the latter case functioning as front, center, or surround speakers." " Thiel is not the only company to use a coincident driver, but they are the only company to use this particular driver, which they make. The mid-woofer has a 6 1/2" aluminum cone, and the tweeter has the same 1" aluminum dome found in Thiel's flagship CS3.7. The tweeter crosses over to the mid-woofer at 2.5kHz. Use "As with most speakers, moving the SCS4s closer to the wall behind them boosted the bass but reduced its definition. Moving the speakers farther out into the room didn't affect the sound but took up valuable real estate." "Amplification is always an issue with Thiel speakers, which are best suited to solid-state amps that have lots of power." Value "The combination of well-balanced timbrel and dynamic performance, placement flexibility, and robust build quality make the SCS4 a solid value." By the time this article is published, most of the economic-stimulus checks will have been mailed to American tax payers. What better way to spend that money than on audio equipment? The SCS4 -- $1980 USD per pair -- was added to Thiel's lineup last year. It is the smallest speaker that the company produces, and therefore the one that stretches your economic-stimulus dollars furthest. It was designed for duties both in music and home-theater systems -- in the latter case functioning as front, center, or surround speakers. Many manufacturers claim that their speakers are suited to work in the center-channel position, but the SCS4 has a significant advantage over most designs. The coincident driver, which places the tweeter dome at the center of the mid-woofer cone, will yield acoustically identical results whether the speaker is placed vertically or horizontally. Furthermore, the frequency response of the speaker should not change greatly when listeners are seated slightly off-axis. Such orientation flexibility is not usually necessary in a dedicated music system, but it should result in an exceptionally coherent front soundstage in home-theater applications. The SCS4 is rather large and boxy, measuring 8 1/2"W x17 1/2"H x 11 3/4"D and weighing 25 pounds. The cabinet is constructed with an aluminum front baffle and 1"-thick, double-laminated sides, with heavy internal bracing. The SCS4 feels respectably solid, but the knuckle-rap test does indicate a box rather than a brick. The review samples were finished in a real-wood black ash veneer, which has the dubious distinction of looking nearly as artificial as its ubiquitous vinyl imitation. Setting aside my dislike for this particular finish, I must admit that the quality of materials and workmanship of the SCS4 are beyond reproach. Thiel is not the only company to use a coincident driver, but they are the only company to use this particular driver, which they make. This use falls perfectly in line with Jim Thiel's advocacy of time and phase coherence, because, when properly executed, the two drivers should behave as though they are a single point source. 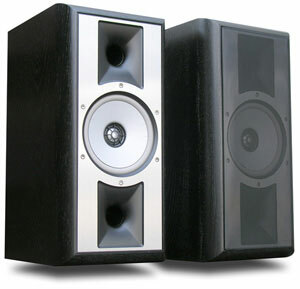 The mid-woofer has a 6 1/2" aluminum cone, and the tweeter has the same 1" aluminum dome found in Thiel's flagship CS3.7. The tweeter crosses over to the mid-woofer at 2.5kHz. The driver is flanked by two front-firing ports -- maintaining the design's symmetry. The metal grilles mount seamlessly to the front baffle by means of magnets. Around back is a single pair of very beefy binding posts. The SCS4's specifications are what you would expect from a moderately sized speaker -- a midimonitor. Frequency response is rated at 48Hz-20kHz (+/- 2dB), sensitivity is a claimed 87dB/W/m, and the nominal impedance is 4 ohms. Thiel recommends a minimum amplifier power of 30Wpc. Thiel also furnishes the phase response of the speaker, stating it to be "minimum +/- 10º." Such a specification is not terribly helpful because other manufacturers rarely provide it, but if you want to make comparisons, we at the SoundStage! Network publish phase measurements of many of the speakers we review. See www.speakermeasurements.com. I found the SCS4s not terribly fussy with regard to placement. They ended up with the centers of their front baffles 39" from the front wall, 6 1/2' apart, and angled in toward the listening position. As with most speakers, moving the SCS4s closer to the wall behind them boosted the bass but reduced its definition. Moving the speakers farther out into the room didn't affect the sound but took up valuable real estate. Once I got the SCS4s where they sounded best, I coupled them to my 30" Plateau speaker stands with a few blobs of Blu-Tack, and connected them to my amplifier with runs of DH Labs Q-10 speaker cable. Amplification is always an issue with Thiel speakers, which are best suited to solid-state amps that have lots of power. I had nearly the opposite -- a mid-power (50Wpc) tube integrated amp. While the SCS4s and my amp may not have been an ideal pairing, I was certainly able to hear what the speakers were capable of, and my integrated never ran out of power. Still, if you audition the SCS4s, hearing them with a solid-state power or integrated amplifier is a good idea. When you look at a speaker, you tend to form certain impressions about its sound, even before it has been fed a signal. The SCS4 is a rather large minimonitor, and from such a speaker you would expect a good sense of musical scale. In this respect, the SCS4 didn't disappoint. No loudspeaker can truly reproduce the scale of an orchestra, but I was struck by how well the SCS4 managed this task on Kodály's Háry János Suite [Teldec 9031-77547-2]. This amusing little piece has numerous exposed solo passages interspersed with full orchestral tumult. Not only did the SCS4 render the volume difference in these passages exceptionally well for a speaker with a 6 1/2" bass driver, it didn't become confused in the sections with full instrumentation. Sometimes when listening to large-scale orchestral music, I feel that I'm missing something with monitor speakers. I never felt that way with the SCS4. Bigger speakers will sound bigger, but these will be just fine for most rooms and most listeners. From the upper bass, through the midrange and into the treble, the SCS4 was very coherent, with the transition from mid-woofer to tweeter being inaudible. You may find a sweeter midrange elsewhere, but you'd have quite a bit of trouble finding a more honest one. Moving further up the frequency spectrum, I did feel that the SCS4's treble was slightly shelved down, which resulted in a little less harmonic information and a little less air around instruments than I am accustomed to hearing. However, a few recordings seemed to contradict this impression. On "Gravity" from Alison Krauss and Union Station's Lonely Runs Both Ways [Rounder 11661 0525-2], Ms. Krauss's voice had an excessively breathy haze around it that results from singing very close to the microphone. To a certain extent, that is a quality of the recording, but it seemed to be brought out a little more by the SCS4 than by other speakers I have on hand. Similarly, I noticed a little more sibilance on other female vocalists from time to time. I also noticed, on symphonic recordings, that high notes in the woodwinds could occasionally take on a bit of extra energy such that they jumped out of the timbrel fabric of the orchestra. Again, these problems were subtle and not evident on every recording, but they do suggest that the SCS4's high-frequency performance is less flat than is ideal. One of the purported benefits of a phase-coherent design is exceptional soundstaging abilities. On recordings that possessed a credible soundstage, such as 3 Concertos for a New Century [NorthWest Classics 109206], the SCS4 presented a sonic vista that was both wide and deep. Instruments had distinct positions from left to right, and the various sections of the orchestra were properly layered front to back. There are many speakers in the SCS4's price class that can produce a similarly expansive soundstage, but fewer that can match it for precise placement of instruments and singers. Phase coherence or no, the SCS4 cannot cast a holographic image to rival the Esoteric MG-10s, but, at one-third the price, that hardly counts as criticism. If laser-etched precision is your top priority, then you should look elsewhere. But be aware that at any price you're far more likely to do worse than better in this regard with other speakers. For me, one thing that separates speakers that sound like live music from those that do not is the speed with which they can follow transients. It isn't really that a speaker can make a transient event happen more quickly, but some speakers smear such impulses over too long a time. The Thiel SCS4 handles transients better than most speakers, even many that cost far more. Whether a plucked string or struck drum head, the Thiels gave the sound a lifelike edge. Driving them with a good solid-state amplifier is likely to improve their transient performance further. We typically refer to the end of each note as decay, and, to my ears, it seemed as though the SCS4 robbed notes of the last little bit of decay. Certainly the SCS4 is not stuffy and overly damped, but in Pehr Henrik Nordgren's "Portraits of Country Fiddlers" on Portraits [Alba ABCD 205], the pizzicato notes had the proper "pop" of an attack but lasted just shy of how I've heard them from other speakers -- and how they sound when heard live. Moving to the bottom end, given the size of the SCS4, I expected it to have deep, impactful bass. What that assumption fails to take into account is that the mid-woofer used in the SCS4 is of a fairly typical size, even if the cabinet seems large. In my room, the SCS4 was able to excite a cluster of modes in the lower 30Hz region, but otherwise the bass extension was unremarkable. Neither did the speaker produce impact belying the size of its driver. The Thiel speaker has very respectable bass performance for a two-way monitor, but it can be bettered in depth and weight by some other designs. Of course, the typical two-way monitor doesn't really have any bass; rather, it has a midbass bump that gives the impression of bass. The SCS4 doesn't seem to have such a bump, leading to a more honest but less weighty presentation. This is not what I would consider a lean-sounding speaker, but it has a little less bass bloom than some other two-ways. Less bloom means tighter, more agile bass, which will be a welcome trade for many listeners -- particularly in smaller rooms. The difference can be easily heard on many jazz-combo recordings. Through the SCS4, all of the notes of Peter Washington's bass solos on the Bill Charlap Trio's Live at the Village Vanguard [Blue Note Records 7243 5 97044 2 5] were perfectly audible, but they tended to focus a little more on the string and less on the body of the instrument. I found the Thiel SCS4s to have a bigger sound than their cabinet size implied. They reached fairly low in the bass and retained good control to below 50Hz. They also played quite a bit louder than I expected. Speakers with first-order crossovers have broad driver overlap, making power handling a problem. I have no idea how Jim Thiel overcame this limitation, but I could jam a lot of power into the SCS4s and play them very loud without noticeable distortion. The overall tonal balance was quite natural, making for an even-handed sound. In particular, the midrange was ideally presented so that voices were wholly realistic without any unnatural emphasis or recession. Coupled with the placement flexibility, I could see these speakers as recording monitors, because they tend to show you exactly whats on the recording, save for the low, low bass. I also found the imaging specificity to be stunning. Even with the speakers spread wide apart (about ten feet! ), I achieved rock-solid center fill accompanied by images that hovered holographically in space. The SCS4s dont cast the largest soundstage of all the speakers I use, but they did create the most precise stage in terms of image placement that I've heard. In fact, it didnt take me long to get addicted to this level of precision, making everything else I have in my room seem out of focus by comparison. But there are some issues with the SCS4s, having mainly to do with their tweeters performance. First, the top end isnt as refined-sounding as that of the best two-ways at this price. Cymbals can be a little splashy, and the entire treble range can sound a touch dry. Furthermore, you can buy better top-end performance for less. The Paradigm Signature S1 v.2 that I reviewed in late 2007 costs $1500 per pair and has a beryllium tweeter that sounds as clean, clear and airy as the best tweeters available. When it comes to high-frequency performance, its a clear step up from what the SCS4s provide and priced quite a bit lower. Also, although the overall tonal balance of the SCS4s is rather neutral, depending on the source material the top end can sound uneven. For instance, I was listening to various recordings with acoustic guitar. Overall, the balance seemed quite natural, but occasionally some notes seemed more prominent than others. Whereas in the bass and mids the speaker sounds ideally balanced throughout, the top end was not as consistent. Im not talking about gross anomalies here, but competing products -- like the Paradigm S1 v.2 and PSBs new Synchrony Two B -- are more overtly neutral, so artifacts like these deserve comment. If the SCS4s were $3000 or $4000 per pair, Id have a hard time recommending them, mostly because of the treble performance. However, at $1980 per pair, they deserve some slack, as no speaker in this price range is near perfect and the SC4 has some real strengths. I enjoy the placement flexibility and cost advantages of small speakers, but I do occasionally miss hearing the bottom octave of what might be on any particular recording. As if forecasting this, Thiel sent along an SS1 subwoofer ($2900) to use with the speakers. This is the smallest sub in Thiel's SmartSub line, and it requires the use of a passive outboard crossover ($500), which Thiel also makes. I've heard systems based on two-way monitors and subwoofers on a number of occasions. Some of these systems sounded as coherent as full-range speakers, and others sounded dreadful. The Thiel SS1 represented my first experience in setting up my own such system in my listening room, and I was amazed at how easy it was. I simply ran an extra pair of speaker cables from the output terminals of my amplifier to the external crossover -- this unit has a crossover point and slope specific to your main Thiel speakers -- and from there an XLR interconnect to the subwoofer. On the sub's back panel are knobs for adjusting the output depending on the sub's proximity to boundaries. The knobs are calibrated in meters so there are no calculations and no guesswork. You just measure and set. How did it sound? Superb. Not only could I now hear and feel notes in the bottom octave, but the sense of space from good recordings expanded enormously. I would liken the experience to listening to a performance from the door of the auditorium, then stepping into the space itself. From the door, you have some sense of how big the hall might be, but stepping across the threshold is a more visceral experience. I was also impressed with what the SS1 didn't do. It didn't call attention to itself. In many sub-sat systems -- particularly when setup by inexperienced people such as myself -- it is all too apparent which sounds are coming from the sub and which are from the main speakers. Sometimes the same sounds are coming from both, and the result is far worse than leaving the sub out of the system altogether. The SS1 integrated seamlessly with the SCS4s. At first I was skeptical about adding the SS1 and crossover to my system, but the ease of installation and sonic contributions were truly impressive. At a little over $2000 per pair -- and rising daily thanks to the fall of the US dollar -- my Amphion Argon2s are a good comparison in many respects to the Thiel SCS4. Their prices are similar, as are their cabinet sizes. Both designs use drivers fabricated from aluminum and of equal size to one another. The mid-woofer cone of the Thiel coincident driver even acts very similarly to the waveguide around the Amphion speaker's tweeter. Despite these similarities, there are some notable sonic differences. The Amphion Argon2 is a fundamentally neutral speaker with just a touch of warmth. On the low end its frequency response extends beyond that of the Thiel SCS4, and does so with slightly more authority. Neither of these speakers is full range, but the Argon2 comes a little closer to being so. Through the upper bass and midrange, both speakers exhibit comparably flat, honest performance, but the high-frequency performance of the Argon2 is simply more even than that of the SCS4. The Amphion speakers present the harmonic textures of instruments more naturally than do the Thiels. If you listen primarily to modern acoustic recordings, that increased realistic texture will make the Argon2s the better speakers. If, on the other hand, you listen primarily to amplified music, then the difference will be far less noticeable, if at all. When I listen to jazz recordings from the 1950s, as I like to do, the difference also disappears, because often the highest frequencies never even made it onto the master tape. 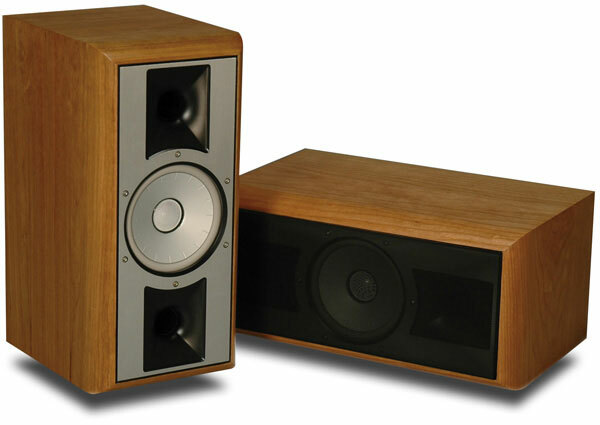 Although the Amphions can sound plenty big for bookshelf speakers, in many cases I felt that the Thiels sounded bigger. As noted above, the Amphions can give a little more in the bass, but when the volume is turned up the Thiels seem to play a little more effortlessly. For my listening preferences, the added bass of the Argon2s give them a better sense of scale, but if you like your music louder than I do, or you have a subwoofer to handle the bass, the Thiels would be better capable of making you forget that you were listening to what is in absolute terms a small speaker. In other aspects of performance, there are still differences, but very minor ones. Both pairs of speakers image very well. The Amphions give the soundstage a little more volume, the Thiels a little more precision. Both speakers are also very good at resolving fine details. The slightly drier decay of the SCS4s can make some details more apparent, but that decay is, itself, a detail that should not be overlooked. The way in which an ensemble or even a single instrument interacts with the recording's space is a difficult thing both to capture and to reproduce. When those details are there, the Amphion speakers do a slightly better job at conveying them than do the Thiel. A few years ago, $2000 seemed a lot to spend on a pair of two-way monitors. Sadly, this is not the case anymore, with $2000 being slightly above the entry point for smallish two-way speakers. While there are a number of very good speakers for less money than the Thiel SCS4s, you can also pay far more for monitors and fall well short of the SCS4's virtues. The combination of well-balanced timbrel and dynamic performance, placement flexibility, and robust build quality make the SCS4 a solid value. In summarizing the sound of this speaker, I'd say it's self-effacing -- even-handed to the point of being unremarkable. This could be considered damning with faint praise or praising with an honest ear. Either way, there are many things to like about the Thiel SCS4, including its overall sonic performance. And if you're committed to buying American with your economic-stimulus dollars, a Thiel speaker will certainly fill that bill as well. Price: $1980 USD per pair.